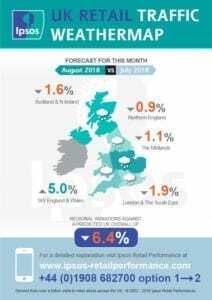 Holiday Counties: Cornwall, Devon, Dorset and Somerset, continue to increase footfall during the summer months with a forecast of 5%, increase on July. However, this only tempers the overall downward trend over the last 12 months, down 10.8% for the whole country. This includes annual dips in all regions, since this time last year. The 287,000 square foot Guildhall Shopping Centre in Exeter, Devon is at its busiest at lunchtime on Saturdays as measured by Google analytics. According to the same statistics, collected from mobile phone data, the footfall signature for the centre shows a typical single lunchtime peak throughout the week. The Centre, built in 1976 and distinctive for the Medieval Church incorporated into its structure, is owned by Aviva Investors who submitted plans for a dining quarter extension in October last year. Click for more information on the Ipsos Retail Footfall Weather Map. Bayfield Training’s next Shopping Centre Investment Course is in London on the 15th to the 17th October 2018.